As roundly expected, the Federal Reserve held steady. Mr. Jerome Powell claimed his band of 12 would be “patient” with rate hikes. But we are not so concerned with the day’s changing scenery, the shifting kaleidoscope. Our concern is rather the grand sweep, the long view… the perspective of the circling eagle. Today we attempt a wider glance. What holds the eternal key to growth and prosperity? The stock market took Powell’s announcement in full stride. The Dow Jones jumped 435 points today. The S&P added 41 points, the Nasdaq, a raging 155. But to return to our question: What is the source of long-term prosperity? Productivity growth averaged 4–6% for the 30 years post-WWII. But average productivity has languished between 0–2% since 1980. Meantime, labor productivity averaged 3.2% annual growth from World War II to the end of the 20th century. What might account for America’s declining productivity growth? Might it relate to Nixon’s murder of the gold standard in 1971? The gold standard, crippled though it was in its dying days, enforced an honesty. A nation that consumed more than it produced would eventually deplete its gold stocks. The fiat dollar removed all checks. 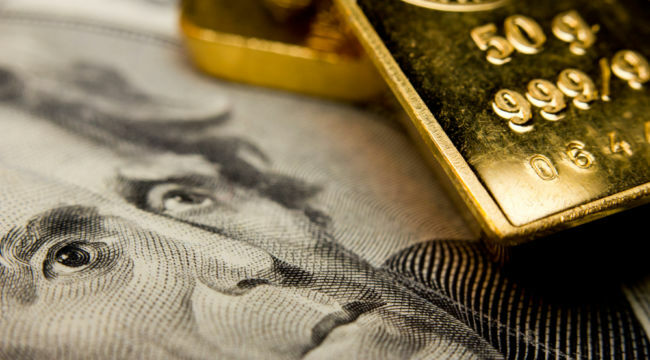 America no longer had to produce in exchange for goods… or worry about losing its gold. And the Federal Reserve could spread its nets. The stagnation of productivity growth started in the early 1970s. 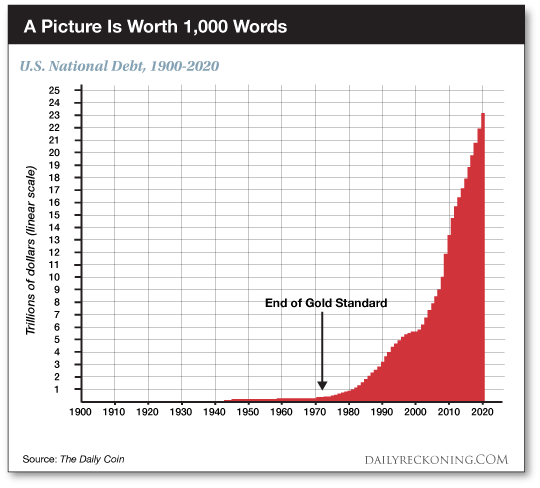 To be precise it was the result, in part, of the removal of the gold standard and the resulting freedom the Fed was granted to foster more debt… over the last 30 years the economy has relied more upon debt growth and less on productivity to generate economic activity. “Unfortunately, productivity requires work, time and sacrifice,” he adds. And the slow grind of productivity yielded to lure of the fast buck. A debt-based economy steals from the future to satisfy today. It brings tomorrow’s consumption forward to today, that is to say… and leaves the future empty. A dollar of debt just doesn’t carry the load it once did. Fifty years ago, $1 of debt yielded perhaps $4 of economic growth. Every borrowed dollar since 2008 may have yielded as little as 40 cents. That is, last year’s borrowed buck wielded perhaps 1,000% less juice than 50 years ago. In 1970 — the year before Nixon cut the dollar’s final tether to gold — public debt totaled $275 billion. Or in today’s dollars, $1.2 trillion. The United States government has since borrowed some $11.6 trillion since the financial crisis. But the American economy expanded only $5.1 trillion over the same space. That is, GDP has increased 35%. But the national debt has risen 122%. And the Congressional Budget Office estimates debt is expanding at a 6% annual rate. Meantime, average real annual economic growth since 2009 runs to 2.23%. Compare the past decade’s 2.23% to the larger 3.22% trend since 1980. One percentage point may seem a relative trifle. And one year to the next it is. But Jim Rickards says the United States would be $4 trillion richer had the 3.22% trend held this decade. A society that grows at 3.22% will be twice as rich as one that grows at 2.23% over the course of an average lifetime.